This annual event – the Feast of St. John – is NOT a stodgy affair, and is our way of promoting our belief that each man has a responsibility to help make the world a better place…all while having fun doing it! During this fun event, all of the collected “fines” are donated to the Grand Master’s Project as part of our culture of philanthropy, where we make a profound difference for our brothers, our families, our communities, and our future. The Masonic Homes of California: Through residential facilities, statewide outreach, and support for youth with mental health difficulties, the Masonic Homes provides critical, relevant services to Masonic family members throughout California. California Masonic Foundation: Since 1969, the California Masonic Foundation has supported public schools, students, and teachers – from kindergarten to college – through meaningful educational partnerships and scholarships. The Foundation also provides support for community partnerships and nursing grants. The convocation of the Fraternity together at an annual Feast, for the laudable purpose of promoting social feelings, and cementing the bonds of brotherly love by the interchange of courtesies, is a time-honored custom. At this meeting, no business of any kind can be transacted, and the day is passed in innocent festivity. From time immemorial, Freemasons have enjoyed meeting about a “Festive Board” loaded with the fruits of their labor. Special emphasis was placed on the Summer and Winter Solstice, late in June and December, which were, and are, the Feast of St. John the Baptist, June 24th, and the Feast of St. John the Evangelist, December 27th. It is written in the first paragraph of the account of the founding of the Grand Lodge of England in 1717 – on the Feast of St. John the Baptist – and was published in the Book of Constitutions, that the old Lodges in London had two (and only two) purposes in constituting a Grand Lodge: One was to establish a center of union and harmony, the other was to revive the Quarterly Feasts! The feast stood close to the very heart of the Lodge. Even in ancient times, feasts were provided for and, among the rules and regulations, were a fixed and necessary part of the life of a stone mason and were on par with wages. So important was the feast that one of the principal officers – the Junior Warden – had, as the purpose of his office, to be responsible for that function. This fact was reinforced by giving the Junior Warden two Stewards to assist him. For this evening, our Lodge is opening its Festive Board not only to Masons of other Lodges, but to non-Mason gentlemen who may enjoy the talk, laughter and fellowship that flourishes on such a ceremonial occasion. We are not here to be silent and grim sitting on a bench and staring across at a wall…you will find something quite different! Yes, Virginia, there are rules. Of course, there needs to be decorum. But then, rules are meant to be broken! They are simple, steeped in tradition, and enforced. The Brethren and gentlemen present will adhere to all raps of the gavel and give their attention to the East upon the rap of the gavel. Three raps mean all will rise. Two raps call for the attention of the Wardens. One rap means all will be seated. Pay attention to the commands of the Warden in charge of your Column. The Festive Board Ceremonies include Seven Toasts, always undertaken by instruction from the East. When a toast is called for by the Worshipful Master, all will rise. When a toast is ordered by the Warden of your Column, those who will be receiving the toast and responding to it shall then be seated. 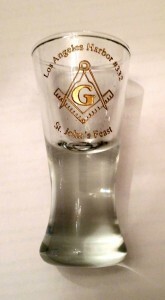 Once the ceremonial toast is given, those who received the toast and will be responding to it shall stand and complete the response in kind manner under direction of the Worshipful Master or Senior Warden. The Toasting Glass is called a “Cannon”. The red firing line is for alcoholic beverages. The blue firing line is for water. Align your cannons carefully on the firing line of your choice when a toast is proposed. Drinking from the Cannon shall not occur except during the toasts; and the correct time to consume courses will be indicated by the East. Cross-toasting is not permitted. Additional toasts are expressly forbidden. The wine shall be served ONLY when the ceremonial toasts are drunk and are poured ONLY at the beginning of a food course. The bottles containing the wine shall not be left on the tables at any time, but are to be in the custody of the Stewards on a separate table. They shall be brought to the table each time the glasses are filled and then returned to the separate table area by the Stewards. Any man present may address the Festive Board after first standing and then asking permission from the East to address the Board. The Battery of three times three and the cry, VIVAT! VIVAT! VIVAT! is only to be given by Masons of any of the Three Degrees. It shall be the express duty of the Master and Wardens to maintain the dignity and decorum that the spirit of the Festive Board Ceremony intends, and, if deemed necessary, to fine or expel any offending person or take any other prudent disciplinary action considered necessary. You will note that the Master’s Hat will be laid on the Alter to collect any and all fines, which will be donated to the Grand Master’s Project. Then to our final toast tonight, our glasses freely drain, Happy to meet, sorry to part, happy to meet again. The Mason’s social brotherhood around the Festive Board, Reveals a truth more precious far, than any miser’s hoard. We freely share the bounteous gifts, that generous hearts contain, Happy to meet, sorry to part, happy to meet again. We meet as Masons free and true, and when our work is done, The merry song and social glass is not unduly won. And only at our farewell pledge is pleasure mixed with pain, Happy to meet, sorry to part, happy to meet again. Amidst our mirth we drink to all poor Masons o’er the Earth, On every shore our flag of love is gloriously unfurled. We prize each Brother, fair or dark, who bears no moral stain, Happy to meet, sorry to part, happy to meet again. We Masons prize that noble truth, the Scottish peasant told, That rank is but a guinea stamp: The man himself the gold. We meet the rich and poor alike, the equal rights maintain, Happy to meet, sorry to part, happy to meet again. Dear brethren of the mystic tie, the night is waning fast, Our work is done, our feast is o’er, this toast must be the last. Good night to all, once more good night, again that farewell strain, Happy to meet, sorry to part, happy to meet again. 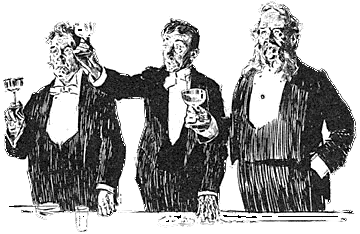 One of the most curious things about a Table Lodge, or Festive Board, is the vocabulary used. The instant that the Feast is opened, a change takes place in the names of things, and no person is permitted to call a plate a plate, or a knife a knife, or anything else by the ordinary name. The rules of The Feast are of very old custom and to which they must be strictly adhered. Breaking any rule will result in a fine. Fines are not a vindictive behavior of one against another, but are a light-hearted manner of provoking humor and raising funds for Charity. Additionally, we strongly encourage those in attendance to “call out” any person attending The Feast for any perceived broach of protocol by proposing a fine to the Master in the East. Obviously, breaking any of The Rules is cause for a fine; however, wearing improper attire, speaking too much, speaking too little, not speaking at all, finishing your meal too fast, finishing your meal last, not proposing a fine…well, you get the idea. Attending this function will cost you something extra because we all support Charity and promote having a good time doing it! Fines are at the discretion of the East upon consultation with either or both Wardens, and are deposited into the Master’s Hat. For those who have not noticed, the Master has a big hat. All of the collected fines are donated to the Grand Master’s Project as a means of Charity. So, plan on humor and spending money for a good cause. The majority of Freemasons’ early meetings were held at eating-houses or wine merchants’ premises. The tavern preferred was one whose landlord and waiters were initiates of the Order. The landlord of the tavern supplied the mugs from which the Brethren drank their ale, while the Lodge supplied glasses for wine. The base, or sole, of these drinking vessels had an extraordinary thickness (several inches of solid glass), which was essential to the vogue of “firing” while drinking a toast. The so-called “fire routine” was a time-immemorial practice of great merriment performed at Masonic festivals. It developed into a definite Sequence of movements during toasting and drinking, performed jointly by the Brethren, with much pomp, delightful uniformity and perfect timing. It ended with a thunderous bang as the empty goblets were simultaneously banged down on the table. Similar ceremonies quickly found their way into American Masonry, and Masonic history informs us that during the American Revolution Washington regularly attended these feasts during the time he was leading the Continental Army. In our colonial days, the Table Lodge was Freemasonry’s greatest asset. It buoyed up the spirit of the Brethren when the spirit of the colonists was low. Even though the repast may have been limited during these times, say, to bread, cheese, and wine, the fervor was there. The first known meeting place of a Pennsylvania lodge was at the Tun Tavern. The first lodge in Boston was constituted at an inn at the Sign of the Bunch of Grapes, on King Street. Table Lodges were presided over by a “Toast Master” and offered a combination of exuberance and good fellowship with high-minded discussions of the important topics of the day. 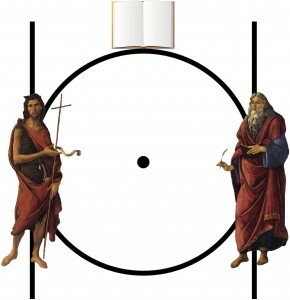 The instruction enlightened the mind, touched the heart, and engaged the will of the men.